Cutting the ribbon to officially open the new Mazergroup location in Moosomin. 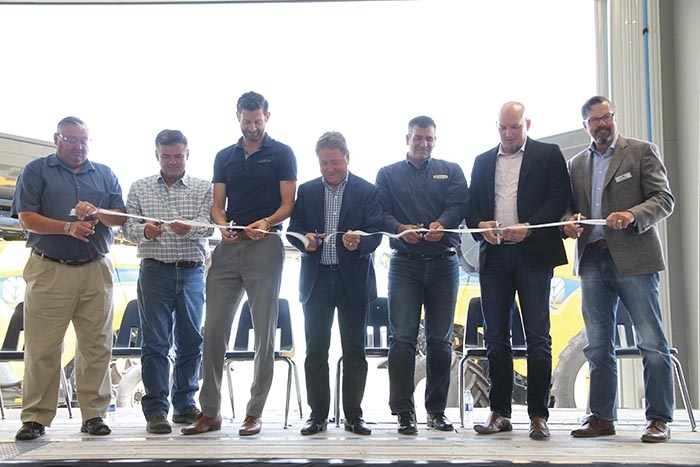 From left are Moosomin Mayor Larry Tomlinson, Randy Tye, VP of Inventory Management, Chris Finley, VP of Parts and Service, Bob Mazer, the President and CEO of Mazergroup cutting the ribbon, Andrew Marshall, Canadian Sales Manager for New Holland, Brad Tarr, the VP of Sales and Marketing, and Wally Butler, the VP of Finance and Administration. Hundreds of people came out for the grand opening of Mazergroup’s new 25,000 square foot dealership Wednesday. Bob Mazer said Wednesday that he was happy to be at the grand opening after the work that has gone into the new building. “It was a long time coming,” he said. Besides greatly enlarging the dealership, Mazergroup has added a NAPA Auto Parts Store to the new dealership. Now that the building has been completed, Mazer said the focus is on building up the business in Moosomin. “We’ve gone from one to three salespeople in Moosomin, our regional manager is coming here two days a week, and our VP of sales and our director of sales are both spending some time out here helping out, and now it’s just a matter of being very diligent,” he says. “If someone’s looking for something, we need to be able to get it for them, and we can now, because we have some space. “According to industry numbers, the amount of new equipment sold out of Moosomin is the same as in Brandon. “We have a lot of room for growth, because we’re in the high teens in market share—the other two guys have over 80 per cent. If we can get to 25 per cent market share we will be happy. We can make a very good business out of that. It might take some time to get there, but I know we will get there. We’ve got good equipment. It’s not just about the equipment, but about building relationships. “As business grows we will be adding to the staff. I’m guessing we will get to nine or 10 techs and six or seven in parts. We should end up between 15 or 20 people. Mazer told the crowd at the grand opening that he is proud to run a family business. “It’s a family business,” he said. “The Mazer family are the majority owners of Mazergroup, yet we have twenty-some shareholders, and about 98 per cent of them are within our organization. All of our executive are shareholders. We really are very proud to be privately owned. We’re proud to be involved with our communities, like Moosomin, and we will continue to be involved in our communities. We do not move money to Vancouver, or Calgary, or Toronto—it stays within our communities. We’re very pleased to be here in Moosomin, and we’re here for the long term. Mayor Larry Tomlinson welcomed Mazergroup’s investment in Moosomin. “It’s a privilege to be asked to speak at this opening,” said Tomlinson. “On behalf of the town of Moosomin, I congratulate Mazergroup on their new building. It’s an awesome facility. Andrew Marshall, Canadian Sales Manager for New Holland, also spoke. “As I look at all of you and I look at all the faces, I see the next generation of farmers,” he said.